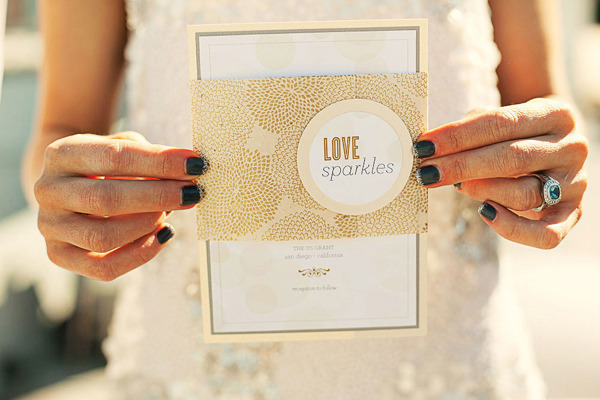 White and gold weddings are simply beautiful. 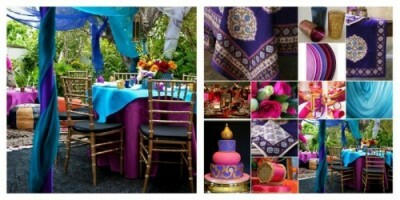 Elegant and sophisticated, bright and glamorous, this color pairing works equally well in chic-contemporary weddings and rich traditional ones. 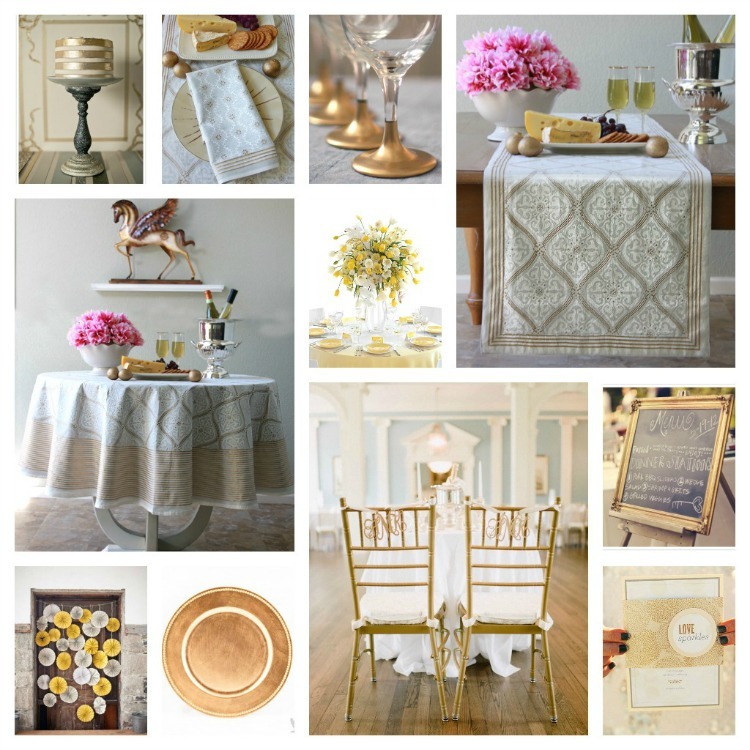 There’s a warmth and a glow to white and gold that seems to embody romance and joy, making it the perfect combo for your wedding. 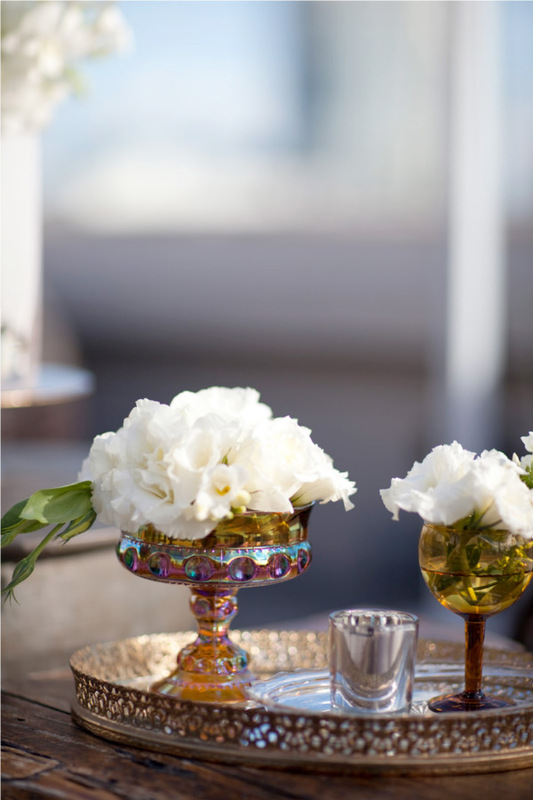 If you’re thinking about a white and gold wedding theme, you’ll find all kinds of inspiration and ideas here, from romantic table linens to amazing cakes and glamorous flowers. 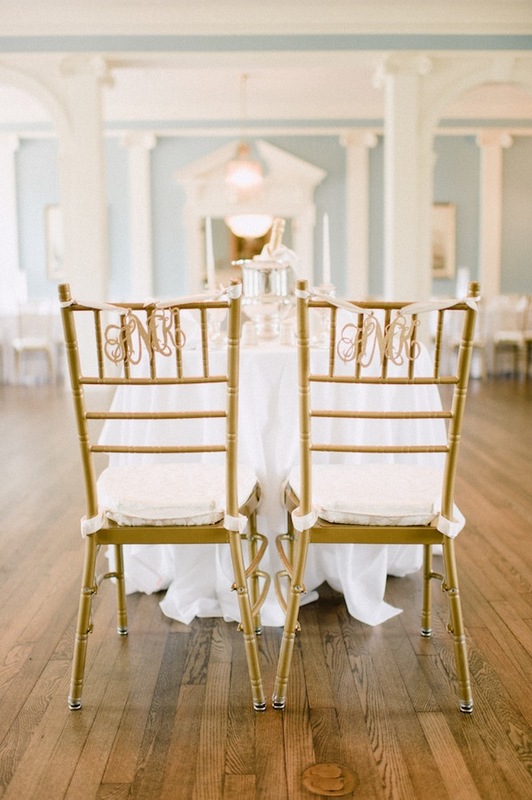 Our white and gold wedding theme is built around our stunning white-on-white Vanilla Glacé table linens. 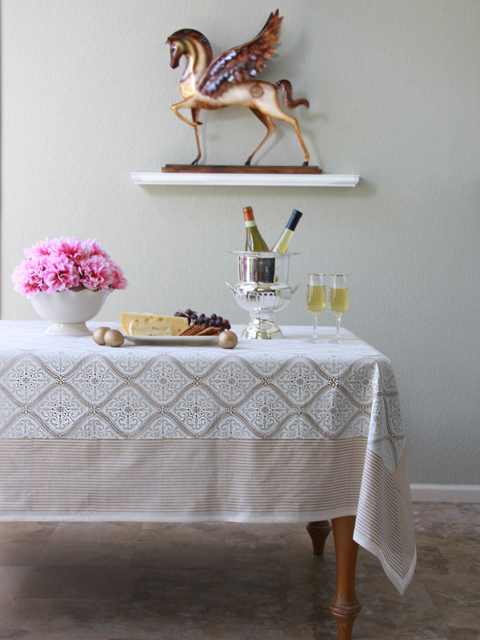 Each 100% cotton piece is hand-printed, inch by inch, by artisans skilled in traditional craft. 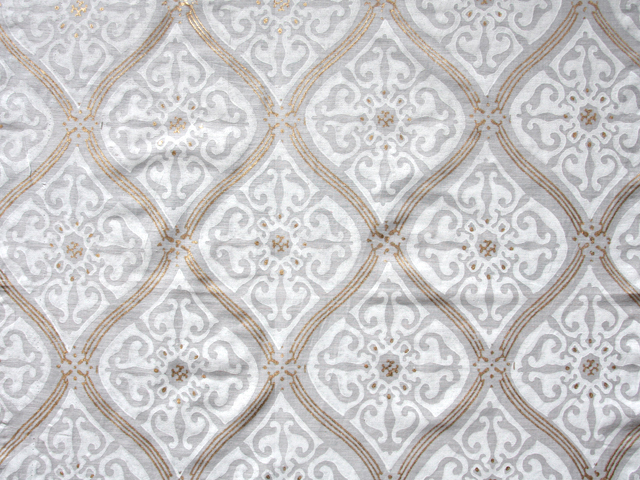 Vanilla Glacé is unique, even among our hand printed collections, in that it is printed with white and gold khadi paste, allowing for slight texture and quite a bit of glimmer. 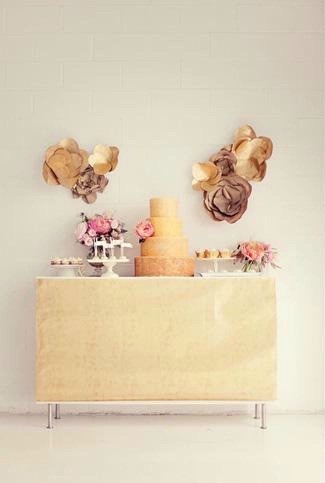 Use round Vanilla Glacé tablecloths for guest tables, a 120″ x 70″ rectangular tablecloth for the bridal party table, and runners along the gift and cake table. 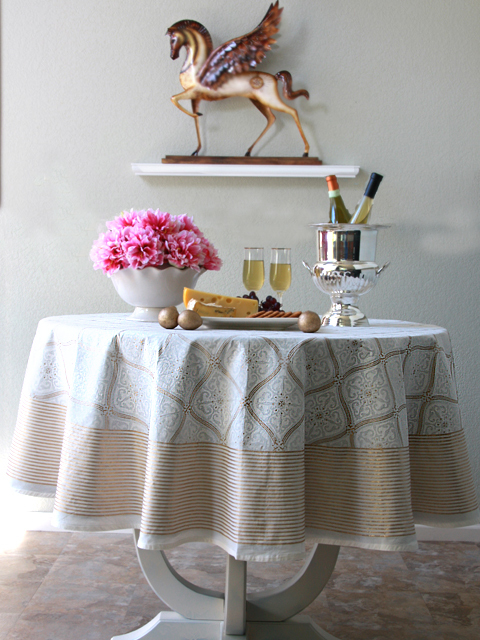 Once the party is over, these heirloom quality linens make unforgettable gifts for the friends and family who have helped you with your special day. 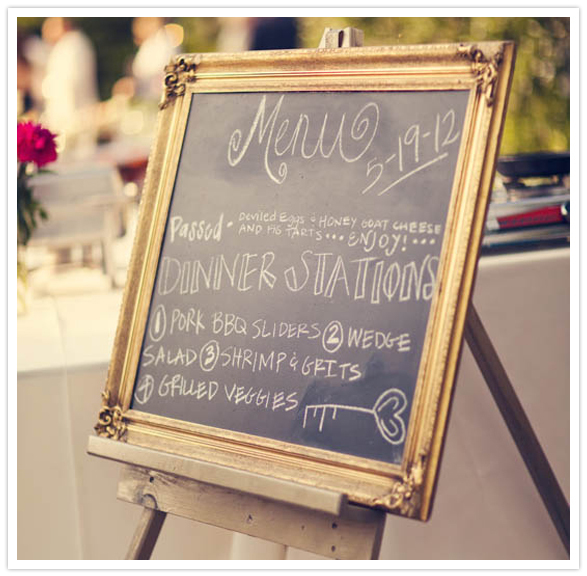 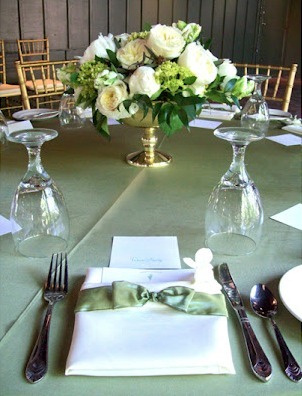 Place settings should be simple and elegant. 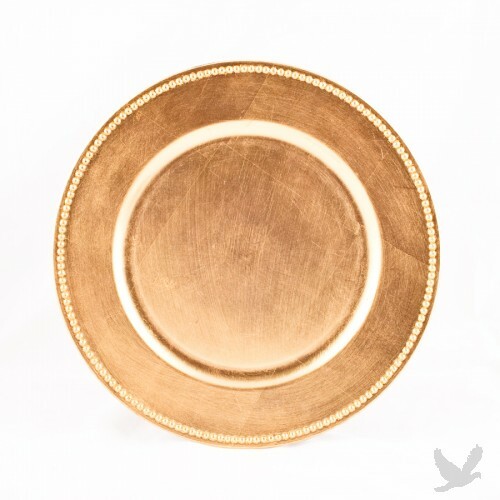 One approach is to use a gold charger and white plate – this is an arrangement that any caterer should be able to provide, easy and opulent all at once. 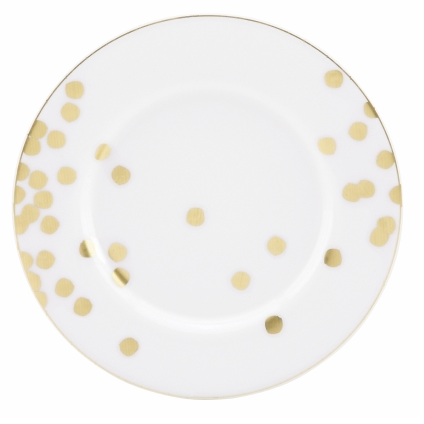 Perhaps the bridal party table could be “bedazzled” with Kate Spade’s Ticker Tape Tidbit plates and uniquely monogrammed chairs. 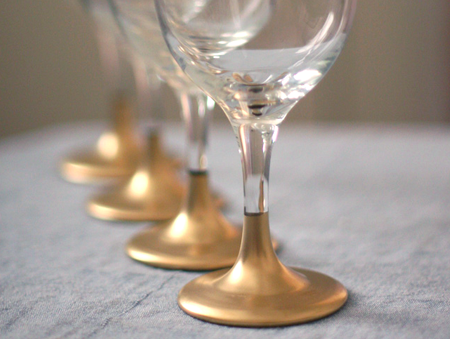 I love the look of the hand-dipped gold stemmed wine glasses below. 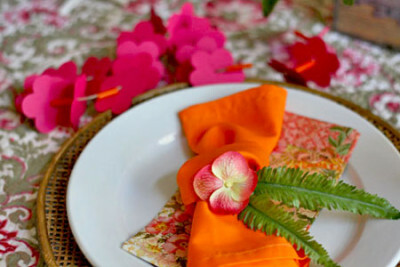 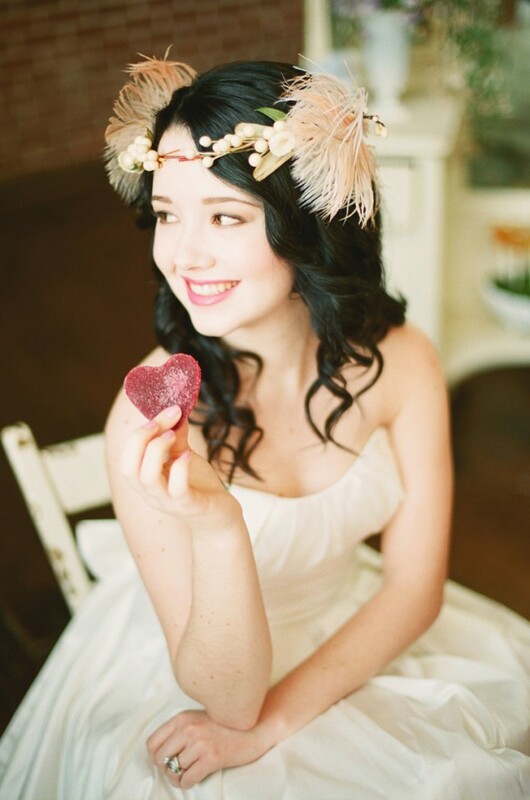 These are a simple DIY that you and your girlfriends could easily pull off in the months before your wedding. 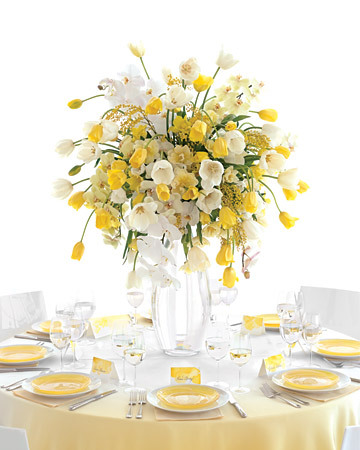 To create a sleek white and gold look, use monochromatic centerpieces that speak of sophistication and polish. 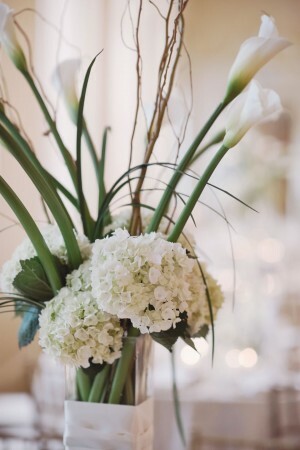 If your look swings a bit more toward grand French country or genteel shabby chic, add a little color to a base of white flowers, and consider using vintage vases or compote bowls. 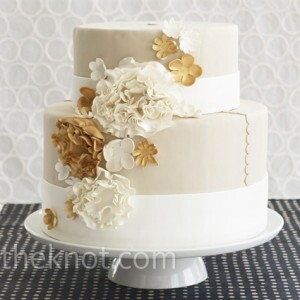 Generally, I don’t abide by the “too pretty to eat” rule, but in this case, I just might have to! 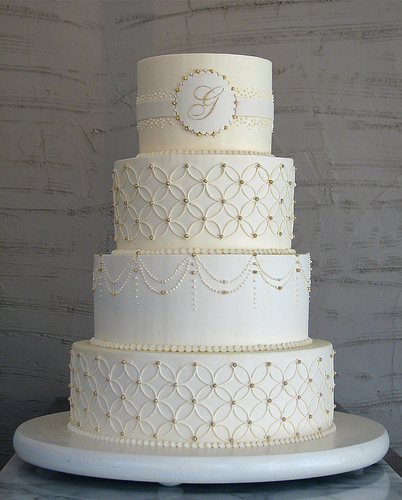 These masterful white and gold wedding cakes are just unbelievable!! 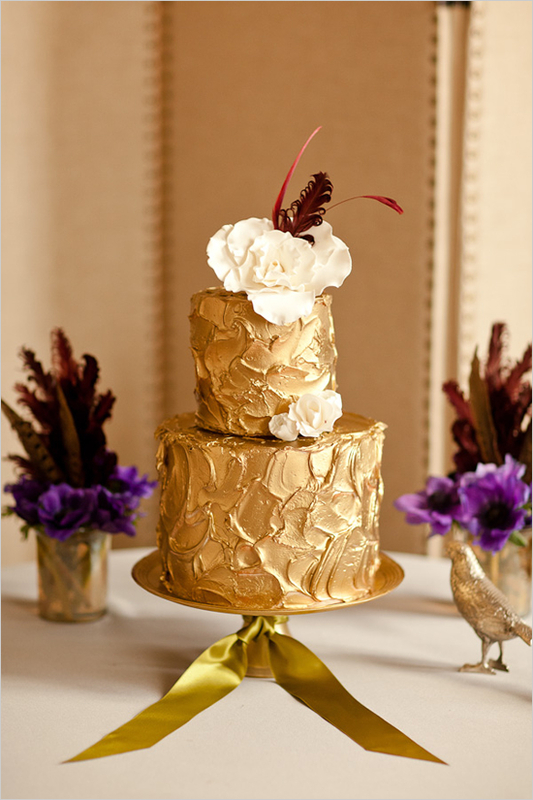 My favorite is the “Metallic Sparkle” cake featured in 100 Layer Cake. 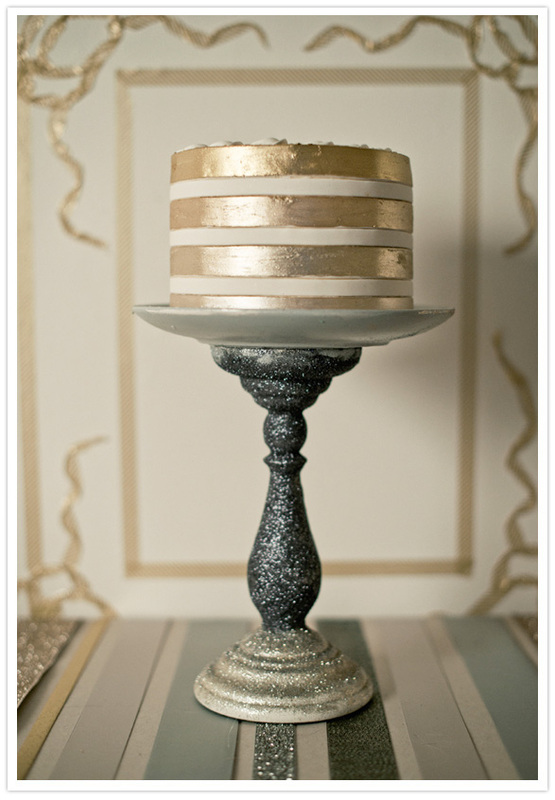 I particularly love the pedestal base – perfect! 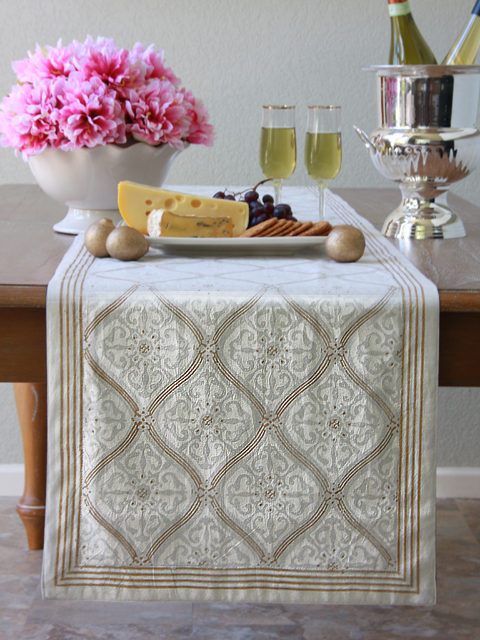 If you like what you’ve seen of our Vanilla Glacé linens, and are considering some pieces for your reception, why don’t you order a swatch? 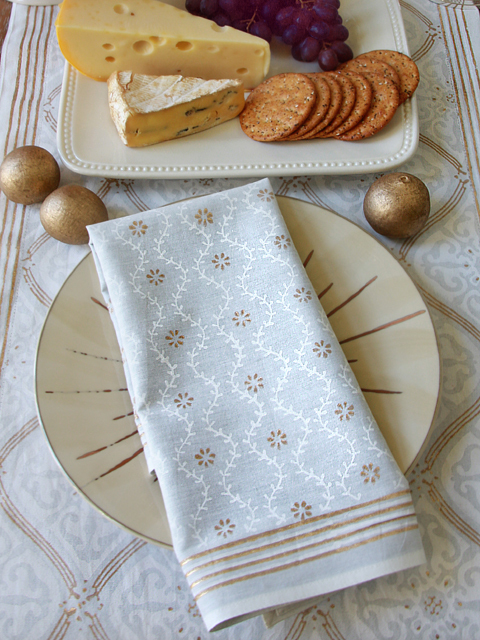 These are generously sized and well priced – you’ll be able to have a first hand feel for the look and touch of this lovely fabric. 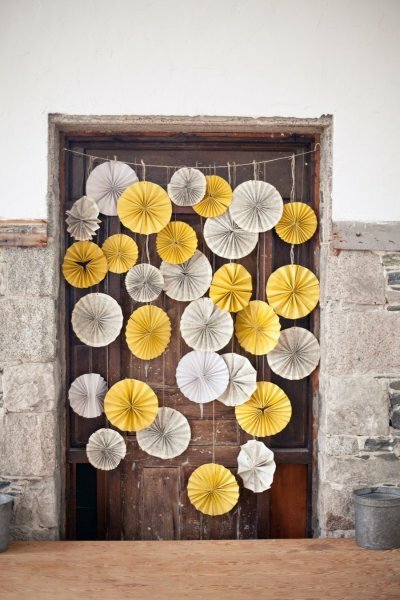 I really like to put all our inspiration images together in a collage – one can really get the sense of the whole look, and of how it might play out in the space.